The Doctor sauntered nonchalantly along the sea road. His hands were in the pockets of his jacket so that his long overcoat swung behind him in what he thought was a rather cool way. And it was. The way the breeze blew his hair back completed the picture of a good looking young… ok, youngish…. man without a care in the world. The only witnesses to that beautiful picture were the seagulls. And he wasn’t, in fact, carefree. He was on a case. He knew there was something strange going on around here and he knew it was the sort of strange that fell into his remit - defending the universe, and more often than not, this little corner of it called Earth, from that part of it that wanted to play outside the rules. A car passed him on the lonely road. He didn’t think anything of it until it stopped a good fifty yards ahead of him and reversed. It stopped again and both doors opened. The young woman in the passenger seat extricated herself from her seatbelt first and was running towards him before the one in the driver’s seat managed to join her. “Doctor!” she cried and he smiled as she wrapped her arms around his neck and hugged him. It was a few moments before he remembered who she was. “I’m great,” she said. “Only, nobody calls me Araminta any more.” She still wore the Goth look clothes, black with spiders-web lace, and her lips were blood red against a pale foundation and dark eyes. The Doctor still thought she looked beautiful in her own unique, non-conforming way. “Come on,” Nancy said. “Let us give you a lift.” The Doctor agreed to that. Susan got into the back of the two door Renault Clio and he adjusted the passenger seat to accommodate his long legs. “So how old are you now, Susan?” he asked out of interest. Nineteen. The same age Rose was when he met her. He pushed the memory back down and swallowed the lump that came to his throat. “So you’re covering this ‘strange phenomena’ story?” The Doctor said to both of them. “Ah.” The Doctor didn’t look as shocked by that as Nancy thought he should look. “Hmm.” The Doctor wondered if he ought to mention that on his planet only academic failures went into journalism. “I think we’re at the end of the line,” Susan noted, looking at the military cordon across the road. Nancy pulled the car to a stop. The Doctor got out and walked up to the barrier. Nancy and Susan watched him as he showed some kind of ID and chatted amiably with the soldiers. He walked back casually and got into the car. They soon reached an inner cordon where those with clearance had parked their cars and gone on foot. Nancy pulled her car off the road and the three of them walked as casually as they could through the barrier, The Doctor flashing his ID. “How come your ID gets us both through with you?” Susan asked. “Psychic paper,” he answered, passing her the cheesy looking plastic wallet with a sheet of grubby paper inside. Susan looked at it and was surprised when words appeared on it. “Susan, always trust The Doctor. He’ll never let you down.” She smiled and watched as it resolved into what looked like a REAL identification card with HER picture on. “Wow!” she said as she gave it back to him. Then she looked ahead of her on the road. There was an ambulance waiting and as they came close to it they saw paramedics bringing a covered body up from the sands, flanked by soldiers. The soldiers and paramedics all looked disturbed. “Both of you stay here,” The Doctor said as he sprang forward. As they loaded the body into the ambulance he climbed aboard. Nobody thought to ask him who he was or what his business was. He unzipped the black plastic bag and looked at the body. He had a strong stomach. He had seen some ghastly things in his time. But even he swallowed the bile that rose in his throat as he looked at this. The body had no skin. Every inch of the epidermis, dermis and subcutaneous layer was gone. Raw flesh suppurated and bled. He hoped the victim was dead before it was skinned. The alternative was too horrible to think about. He took a reading with the sonic screwdriver and found the results interesting. Very interesting indeed. He fastened the body bag again and jumped out of the ambulance telling the paramedics that they could go now. “Why didn’t you let us see?” Nancy demanded when he returned to them. The Doctor took her by the arm and gently pointed her to where one of the soldiers and two of the paramedics, all male, were being sick at the side of the road. Even those who had kept the contents of their stomachs down looked unhappy. “Yes, you were. But we all learn from our mistakes. Come on…” Without another word he turned and dashed off down the road again. He stopped at the edge of the raised and reinforced dyke that prevented the high winter tides from sweeping in over what was, in this estuary area, mostly reclaimed land that lay below sea level and was always one step from being taken back by the waves. He looked out over the wide mouth of the river Ribble where it merged into the Irish Sea. Nancy and Susan caught up with him as he stood there, quietly watching. His actions were puzzling but very interesting for the impartial observer to watch. He didn’t just look. He put his hand over his brow as if to shade his eyes. He made imaginary binoculars with his fingers and looked through them. He moved his head from side to side, closed one eye and then the other, blinked both eyes so rapidly that it brought tears to the eyes of the impartial observer. Finally, he took a pair of black-rimmed glasses out of his pocket and put them on. He looked at the scene through those for a few minutes and then put them back in his pocket. He looked around at Nancy and Susan and grinned widely. “But…” Nancy looked. There was nothing there. “Yes there is,” he insisted. “Look at that bird.” He pointed to a seagull that was wheeling across the sands, maybe forty feet into the sky and some hundred yards from where they stood. Suddenly, it stopped in mid air. They distinctly heard the ‘awwkkk’ sound of a puzzled and stunned bird as it hit an invisible barrier at speed. They saw it fall from the sky to land on the wet sand below. Nancy and Susan both gasped in sympathy and watched the bird carefully for several minutes. They gave a sigh of relief when it came around and took off again after a few attempts and seemed not to be permanently hurt. “I’m not going to say a word about Humans and misplaced sentimentality,” The Doctor said. The Doctor laughed and reminded himself how much he loved the Human race in this era before they officially made first contact with extra-terrestrials, when television science fiction filled in the blanks for them. “What do you mean YOU have hexagons…” Nancy began. “He’s an alien,” Susan told her. “How do I know that?, she demanded. “So I heard,” The Doctor said. 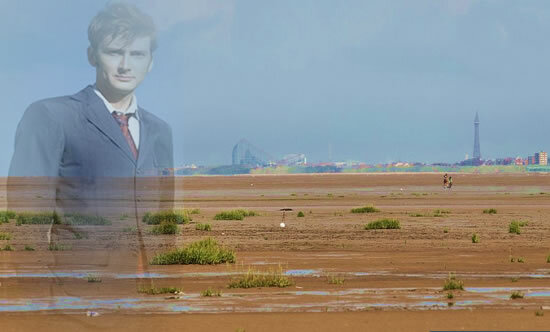 “Though I’m not so sure…” He looked out across the estuary. Several miles of sand, mud, channels and river, and beyond it the Fylde coast and in the far distance Blackpool Tower, the easiest landmark to identify. And between all that, hovering over the sand and mud marked on the map as Horse Bank, there was a spacecraft of a size that boggled even his imagination. It had to be at least three miles wide. It was the translucent white of fine porcelain and was a sort of mushroom shape, with a round dome and a short stalk below. The whole thing hovered about forty feet above the sand. Just about the right level to seriously confuse the seagulls. And as far as he could see it had no windows or doors. He was distracted from his perusal of the alien ship by the arrival of another alien ship – his own – on the back of a low-sided flatbed lorry with U.N.I.T.’s insignia on the door. He had asked them to pick it up for him when he flashed his ID at the checkpoint. He had told them it was specialised scanning equipment. Which was true, in a way. He liked to keep the outright lies to a minimum. He was about to step up and take possession of his TARDIS when a woman ran forward from the group of U.N.I.T. personnel who stood nearby. The Doctor drew in breath and waited until she turned around. He knew he was going to have to go into some difficult explanations and he wasn’t really ready for them. In his own universe, he and Harriet Jones fell out over her decision to order Torchwood to fire at the retreating Sycorax ship. In THIS universe, Nine was still friendly with her. He had saved the world with her blessing a couple more times and she had even gone to his wedding. He was about to step forward and speak to her when another female gave a shriek and ran towards the lorry. He waited as the two women looked at each other then looked at the TARDIS as it was manhandled down from the lorry by the U.N.I.T. men. He winced as it landed with a crunch on the tarmac and forgot about all the other women in his life as he ran to the one female who had been there all his adult life without ever letting him down. “No scratches,” he said to himself, running a soothing hand down the door as he reached for the key. “Doctor?” He half-smiled as he recognised those home counties vowels pronouncing his name with both ‘o’s’ fully rounded and a distinct click to the ‘c’ in the middle. “Who’s me?” Harriet Jones asked. “Who are you? And…” She turned to look at Sarah Jane Smith. “Who are YOU? And what….” Nancy and Susan stepped closer, as if to remind The Doctor that they, too, were part of the equation. “My dad did,” Susan said, a little in awe of the company she was keeping all of a sudden. “I’m The Doctor, Harriet. It’s a long story. And I don’t really have time to tell it right now but….” He turned to Sarah Jane. “Sarah… YOU know me better than anyone. You understand about regeneration. You’ve seen it happen. Please explain to Harriet why I look like this and not… not the man you both expected me to be, and explain to Nancy what sort of alien I am… and….” He stopped. He looked at all four of them, then he turned and went into the TARDIS. He looked at them on the viewscreen and smiled. Four women he admired for different reasons – or maybe for the same reason. Every one of them had the traits he most highly valued in any species. Courage, individuality, the guts to stand up and be counted. Harriet, for all the bitterness of his relationship with the other universe version of her, was a singular leader of her country. Sarah Jane had been an investigative journalist in the days when female journalists were supposed to do the fashion and ladies singles at Wimbledon and the problem page and leave the hard news to the men. Nancy had uncovered the highest level of corruption in her local council and not been afraid to file her copy. Susan dared to be different in a teenage world dictated by fashion magazines where the dominant colours were pastels. Bless them all, especially Sarah Jane, who was carrying the can for him right now. He turned from the view immediately outside the TARDIS and looked at the communications console. He examined the signal he had been receiving ever since he entered Earth’s atmosphere and zoned in on this location. It SEEMED to be an attempt at communication. And yet…. She put her hand on the door as if to run out again, then she turned around and looked at The Doctor as he stood by the console. Then she ran up the ramp from the door and hugged him. She didn’t understand what THAT meant, but he became busy again at the console. Susan watched his hands flying over the keys on what seemed to her to be the weirdest looking computer in the world. “My computer is working fine. But something is wrong with the transmission. The TARDIS is TRYING to lock onto the communication and make something of it, but it's struggling.” He patted the console almost as if it was a dog. “Maybe it didn’t like being dropped by the soldiers,” she suggested, before she realised she was talking about a computer. The TARDIS didn’t shake. Her shock absorbers were better than that. But they felt the vibration and they heard the noise of the explosion. The Doctor’s face changed in an instant from the indulgent smile he had for Susan to anger. Susan looked at him and was glad the look in his eyes right then was not for something she had done. He ran from the console, across the ramp and out of the door, yelling in a language that the TARDIS was too busy to translate. Susan followed at the same speed but without the alien profanities. “*&$%£@#!£$%&!” he screamed as he saw a mortar shell explode noisily against the ‘cloak’ or ‘shield’ whichever it was. He turned and saw Harriet Jones still standing with Sarah and Nancy. He strode towards her and took hold of her by the shoulders. “Step away from the Prime Minister right now or I will shoot,” a voice ordered. 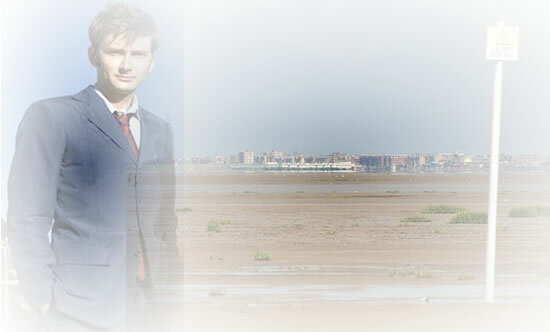 The Doctor glanced around to see a man in a civilian suit but the unmistakeable bearing of a trained CPO. His handgun was trained on him. At the same time he heard the safety catches of rifles clicking off and a slow turn of his head revealed that he was surrounded by U.N.I.T. men with their weapons pointed at his head. He decided that discretion was the better part of valour and stepped away, his hands raised. One of the soldiers moved forward as if to handcuff him for his assault on the Prime Minister. “No!” Sarah Jane exclaimed and she ran to defend him, pushing away the soldier and clinging to his arm. “No, he’s on YOUR side.” Nancy and Susan took their cue from her and ran to flank him, too. The soldiers looked puzzled. The CPO looked nervous. Harriet stepped forward. “I never told them to START shelling,” she said. “But please….” She turned to the man called Norman and told him to pass the message on to the military to cease firing. “Me! Cause trouble!” The Doctor looked indignant, but he walked with the Prime Minister to where they could view the estuary. “So how come you got clearance as a journalist?” The Doctor asked Sarah Jane as they waited and watched several more puzzled seagulls make contact with the invisible ship. They looked as a four man hovercraft set off across the sands towards the place where they had located the alien ship. The driver and one passenger were military. The other two were civilians in suits, not the most suitable clothing for travelling in an open topped vehicle that disturbed a fair amount of sand as it travelled. “How do they expect to negotiate with aliens inside an invisible ship whose language they don’t understand?” Nancy asked. “I think you’re going to be rather surprised when you do.” He said nothing more at that point but went back to looking at the hovercraft as it neared the place where the steady rain of stunned seagulls marked the edge of the ship. The Doctor could see it, of course. He watched the hovercraft slip under the belly of the craft, which told him that the force-field didn’t extend to the ground. Then the men disappeared. The hovercraft carried on moving of its own accord, but in an erratic path with nobody at the wheel. All four men just vanished. No flash of light, no ethereal beam. No shimmer. They just vanished. “Well I imagine…” The Doctor began. He looked around. Nancy and Sarah were both standing there staring out across the estuary at the empty hovercraft. But Susan…. He turned and saw that the TARDIS door was open again. And he KNEW he had closed it before. “Susan….” The Doctor ran to the TARDIS. He was surprised enough that it had opened for her. He was even more surprised to see Susan at the console. He stepped towards her, then stopped, surprised. “How did you do that?” he asked her. The Doctor listened. The message he was hearing was interesting enough. And it explained a lot. But he was even more interested in Susan and how the TARDIS apparently contacted her instead of him when it was ready. “Doctor,” Harriet came into the TARDIS. Her CPO and secretary followed. Sarah Jane and Nancy came after them. But Harriet wasn’t listening to her. The secretary was relaying a message to her. She turned and looked at The Doctor. She didn’t look happy. She turned away and left the TARDIS. Her CPO and Secretary followed. The Doctor stared at her retreating back. “Do you remember the Silurians and the Sea Devils?” he asked her. “Yes,” I’m afraid it does.” He sighed. “But she can’t!” Susan insisted. “You heard the communication. They’re not…. Nobody is….” Susan ran out of the TARDIS. Nancy and Sarah Jane followed. “You think I ought to get a revolving door?” he asked the console, hardly expecting an answer. He sighed and switched off the still repeating communication from the alien ship and went to follow the women. Outside there was something of a commotion, caused by the three women as they climbed down onto the sand and began to run towards the ship. He noticed that they all had mobile phones out and were using them as they ran. “What are they doing?” Harriet asked. “Oh, how silly!” she responded. “I.…” Harriet began to speak and gave up. “Doctor….” Harriet began again, then sighed and stopped speaking. There was a look in his eyes that disturbed, even frightened her. It frightened her because she had the feeling that her next move, if he didn’t approve of it, could lose her his friendship forever. And she strongly felt she NEEDED that friendship more than anything else in the world. The uneasy impasse continued as they waited for the second hovercraft. After a half hour, just when Harriet snapped in annoyance at her secretary demanding to know where it was, they all heard a sound on the sands. But it wasn’t her hovercraft. It was a sort of light-weight beach buggy. It had two passengers and it stopped near Susan, Nancy and Sarah Jane. The two male occupants got out of the buggy and stood with them, holding up a handwritten placard that The Doctor could just about see with his enhanced eye sight. Thank Spielberg for the friendly alien movie genre, The Doctor thought as the two were quickly joined by a dozen more assorted looking people who came running along the sands – neatly avoiding the security cordon across the road. “DID we?” she asked her secretary. He spoke quietly into his radio mike. A minute later a man approached them. He had a Navy medical corps badge along with his U.N.I.T. insignia. The Doctor thought sadly of Harry. “You asked about the autopsies, Ma’am,” he said with the kind of respect to Harriet’s position that was studiedly lacking in The Doctor’s manner towards her. “Coming with me to visit the neighbours. That’s if you can hold off Armageddon for an hour or so.” He looked around at the now significant crowd standing in front of the still invisible ship. There were dozens of hastily erected placards proclaiming that the crowd LOVED aliens and wanted them to stay. The Doctor smiled ironically. Harriet looked at him and bit her lip. She looked at the TARDIS. She looked out to sea at the crowd of British citizens who weren’t altogether happy with her policies just now. She looked up at the BBC helicopter hovering overhead. It surely knew she was there, expecting her to make a decision. He turned and strode off towards the TARDIS again. Harriet took that as her cue to follow and her CPO and Secretary came along behind her. “A TAD bumpy?” Harriet repeated as she picked herself up from the floor, adjusting her hair and the neat row of pearls around her neck and trying to look like a self-assured leader of a country. She wondered if he had done it deliberately in order to shake her both literally and figuratively and assert his own authority on the proceedings. Except that he already WAS very clearly in charge. She wondered WHY they needed organisations like U.N.I.T. and Torchwood when The Doctor just came along and made them both redundant. “Have you?” He asked coldly. “We don’t have time for this,” he said. “We’ve got to talk to the aliens.” He walked to the door and opened it. Harriet stepped beside him. “Go ahead,” he told her. She hesitated and looked at him nervously. They stepped out into a vast, white room - so white it almost hurt the eyes. It seemed to contain nothing at all in the way of technology, and it contained no aliens. It did seem to contain a lot of Humans. Some of them were the original missing fishermen, several obvious tourists, and the crew of the hovercraft who had disappeared an hour ago. They were all looking curiously at the new arrivals. “It’s Harriet Jones,” somebody said and the loudest Chinese whisper in history susurrated around the room. “Nobody is a hostage,” The Doctor said. “You’re all here because of a simple breakdown in communications.” He glanced around at the white walls and then spoke again, apparently TO the walls. “You can speak to me. I understand you,” he said. He paused and listened as something that might have been a form of communication came back in response. To the others it sounded like a clicking and hissing. “We could compensate you for the inconvenience, Doctor,” Harriet said. The Doctor laughed and said something under his breath that sounded like ‘That would be the day,” before he took his leave formally from the alien and returned to the TARDIS. Sarah Jane was looking nervously at her feet. They were starting to feel damp. They were standing on sand that was beginning to become mud and in a little while would become a sea bed when the tide came in. The bold, brave gesture was starting to look a little foolhardy now. “Look!” Susan cried out and everyone forgot that they were standing in rapidly deepening puddles as they saw the invisible alien ship become visible. They had only been able to guess up to now just how big it was, but now they gazed up at the sleek, translucent white, curving walls that gave off a soft diffused glow reminiscent of a huge pearl light bulb. There was a murmur of excitement and they heard shouts from the soldiers up on the road, and the BBC helicopter hovered closer. The TARDIS materialised a few feet above the sand. The door opened and The Doctor reached out his hand. Sarah Jane was the first to run through the three inches of seawater and soft sand to take his hand. Nancy and Susan followed. He looked out at the other people. The alien took three hours to complete its task of gathering up sand and sea water from the Horse Bank. For those hours it was a tourist sensation and the BBC were joined by ITN, Sky news and CNN to capture the amazing phenomena. Rock FM had set up a booth and space related music was interspersed with racy accounts of what was happening. A mobile burger van was doing a roaring trade in ‘space burgers’. The Doctor and his friends watched from the sea road. It gave him time to explain a few things he felt he ought to explain. Sarah Jane thought about that for a while. “We are,” he assured her. Then he turned his attention to the ship. The helicopters all seemed to realise at once that it was time to get out of the way. They backed off safely as the ship began to rise up, a downdraught doing fascinating things to the incoming tide, but otherwise causing no harm to the planet it was preparing to leave. The sight of a three mile wide ship rising into the sky was captured by several hundred tourist video cameras and official military cameras for U.N.I.T.’s records, and by the professional news gatherers. The Doctor smiled knowingly. He knew it would be a sensation for a week or two, and then gradually people would forget. It would be consigned to the UFO websites and the fringe people who liked that sort of thing. So would any number of pictures of the police public call box incongruously sitting in the middle of the excitement. But there were always rumours about THAT alien space ship floating around. He was used to it by now. “I’ll trust you this once,” she answered. He showed her everything as they travelled to South Croydon. The kitchen, the bathroom, the wardrobe, the bedrooms, the martial arts dojo, the swimming pool, the cloister room, the engine room. Susan stared in astonishment at it all. Sarah Jane smiled wistfully and enjoyed reliving the past, but she was adamant that this was a short hop to South Croydon and nothing more. “What do you think?” he asked when they returned to the console room. “Doctor….” Susan reached out to him. She took his hand and was surprised to find that it was trembling. She didn’t quite fully understand what he was saying. But she guessed one thing. It took a lot for him to wear his heart – hearts – on his sleeve and say so very much to her. She glanced at Sarah Jane. But Susan had already realised THAT. “Doctor.…” She squeezed his hand. He looked down at it and smiled. “Good luck, both of you,” Sarah Jane said as the TARDIS materialised in what she recognised as her own back garden. She hugged Susan and kissed The Doctor on the cheek, and then she turned and went out through the door. She stood by her own back door and watched as the TARDIS dematerialised again in a gust of wind and a grinding yet organic engine sound that she would never forget until the day she died.